The "Chronicle Concerning the Early Years of Nebuchadnezzar II" or "Jerusalem Chronicle" or "ABC 5" mentions an early deportation of many Jews in 597 BCE. When I started this blog, I wanted to use it to announce what was new on LacusCurtius and Livius, occasionally adding a review of a book or a museum. What I never wanted to do, was “recycle” other people’s content. I’ve always found that a bit cheap. However, here is an interesting newspaper article that summarizes cuneiform research on the exile of the Jews in Babylonia, which is usually dated to 587/6-539 (the return may in fact have taken place three or four generations later). The article discusses exiled Jews mentioned in the Murashu Archive, who apparently lived near Nippur. This confirms a statement by Ezekiel, who calls this settlement Tel Abib. There’s something to be added to that newspaper article. The Talmud refers to another Jewish settlement, more to the northwest, near Sippar, called Nehardea. At the moment, we can not establish whether this Jewish town, which certainly existed in Parthian times, dates back to the Exile. The Talmud was written more then a millennium after the events it describes, and contains many old legends, so we may be forgiven for being a bit skeptical. Other Jews lived in Babylon. The article refers in passing to tablets that record Jehoiachin’s stay in that city. You can find translations online on my website: here. Other evidence for the Jewish presence in Babylon can be found in Josephus and a tablet that may mention a man named Baruch: both refer to the reconstruction of the Etemenanki during the reign of Alexander. On two occasions, my friend Bert van der Spek, coeditor of the Babylonian Chronicles of the Hellenistic Age, told me that one of his colleagues had discovered tablets that refer to Jewish temple in Babylonia. I would like to know more about those tablets. It is probably one of the best-known and most impressive images from movie history: the spectacular rise of the sun and the earth over a moonscape, in Stanley Kubrick’s 2001. A Space Odyssey. 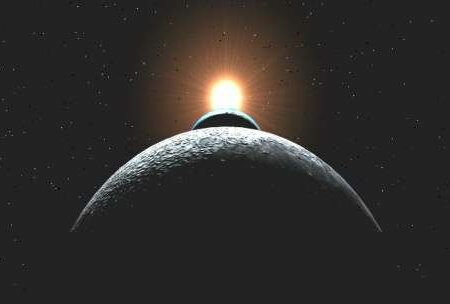 Kubrick seems to have liked the image, because he repeated it several times, with minor variations like the sun rising over a strange monolith or the sun rising over a crescent-shaped earth (video). Of course, it is not just the image that makes this scene unforgettable. It is the splendid music that really matters and makes the experience, in a word, sublime. This is what makes cinema great, and this is why I went back to see 2001 at least five times. Kubrick’s movies are usually full of little, intellectual jokes. To offer an example from his wicked Doctor Strangelove: if in one scene a group of soldiers is ordered to bomb the “Laputa Missile Complex”, it comes as no surprise that in another scene a Soviet leader is visiting a brothel. And yes, la puta is not only Spanish for “prostitute”, but also a reference to Gulliver’s Travels. I said Kubrick was a bit of an intellectual, didn’t I? Perhaps, the intellectual joker in Kubrick also accompanied the artist when he created the sunrise in 2001. The impressive music is from Richard Strauss’s Also sprach Zarathustra (“Thus spoke Zarathustra”), and belongs to a part of that symphonic poem that represents a sunrise. Well-chosen, but there is more to be said. Strauss’ tone poem was in turn based on Friedrich Nietzsche’s book with the same title. The philosopher was not particularly interested in the Iranian prophet Zarathustra, but merely needed a hero that was older than Judaism and Greek philosophy, and lived at the dawn of history. It seems that Kubrick did some research into Zoroastrianism, the religion founded by the real Zarathustra. The alignment of a lunar crescent and the sun is a common theme in eastern art. It can be seen, for example, on every Achaemenid royal tomb, and I would not be surprised if Kubrick knew it. An even closer parallel can be found on two monoliths from Harran, which can be seen in any book on ancient eastern art: the Babylonian king Nabonidus venerating the moon crescent, a planet, and the sun. Perhaps some of you will object that Babylonian art has little to do with Zoroastrianism, or remark that it is debatable whether the Achaemenids adhered to the teachings of Zarathustra. Of course that’s fair criticism, but as I said: Kubrick was an intellectual and an artist – he was not an Iranologist.